After the royal engagement ring is slipped on the finger of a princess-to-be, as it was for Sofia Hellqvist last week in Stockholm, all sorts of preparations begin for her new royal role. Bridal gowns and wedding details are high on the list, but a future princess also must begin thinking about building up a proper collection of jewelry for the state visits, charity functions, national days, and other events she will be attending once she becomes an HRH. For all of you soon-to-be princesses -- that's you, Lili Rosboch von Wolkenstein and Sofia Hellqvist -- and those who have recently joined the ranks -- that'd be you, Claire of Luxembourg -- I'm listing the top ten pieces of jewelry that I think any new princess (or just a regular gal who is a princess of her own life) should consider adding to her jewelry box. Feel free to offer additional suggestions in the comments below! You've already shown off your engagement ring to your friends, family, and the media, but this is the ring that really symbolizes your new royal status. If you're marrying into the British royal family, you may get a ring specially made for you from rare Welsh gold. Not all royal wedding rings are gold, though; Princess Charlene of Monaco received a platinum Cartier band from her prince. This weekend, the Swedish royal family announced that they will soon have a new member: Sofia Hellqvist, who will become Princess Sofia, Duchess of Värmland when she marries Prince Carl Philip next summer. But she's not the first Bernadotte bride to be named Sofia. Today, we're looking at a tiara that belonged to the Bernadotte queen who shared her name: Queen Sofia's Tiara. You'll sometimes see this sparkler called "the Nine-Prong Tiara" -- because, as you can all see, there are nine diamond “prong” elements dotted across the top of the piece. The Swedish court, however, calls the piece “Queen Sofia’s tiara,” in reference to the tiara’s original owner, Sofia of Nassau, the consort of King Oscar II. 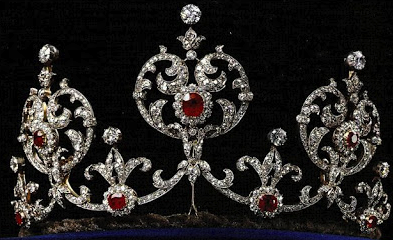 The royal court states that the tiara was made for Sofia around 1860, perhaps when she became the Swedish crown princess. It was certainly in the royal collection by 1872; Trond Norén Isaksen notes that the tiara is listed on the jewel inventory made after the death of Sofia’s brother-in-law, King Carl XV. He also speculates that the tiara could have been made by remodeling a diamond comb that once belonged to the first Bernadotte king, Carl XIV Johan. Yesterday in Stockholm, the Swedish royal court announced news that had been anticipated for years: Prince Carl Philip, the son of King Carl XVI Gustaf and Queen Silvia, was engaged to his longtime girlfriend, Sofia Hellqvist. The princess-to-be sported a large diamond engagement ring during the couple's meeting with the press. Many Swedes actually don't exchange elaborate engagement rings; they often swap simpler gold bands for the engagement, saving the more glittering ring for the bride on the wedding day. Some of the Bernadottes have followed this tradition, while others have exchanged sparkling engagement gifts. Let's have a look at some of the rings that engaged Swedish royals have worn over the years, shall we? The first of the Haga princesses to marry was Princess Birgitta, who announced her engagement to Prince Johann Georg of Hohenzollern on December 19, 1960. The photograph above is of their engagement announcement; you can see that they've apparently followed the traditional Swedish custom of exchanging gold rings for their engagement. Birgitta and Hansi had two wedding ceremonies in 1961 (one in Sweden and one in Germany), but their happiness did not last. Although the two have never divorced, they have lived separately since 1990. Time again for a week's worth of royal jewels! We've got a glittering state visit, serious heirloom brooches in Northern Ireland, a brand new tiara, AND a surprise engagement announcement! Enjoy! 10. Princess Charlene wore little jewelry at the opening of the yacht club in Monaco, but super-chic Princess Caroline wore a pair of sparkling bracelets, plus small earrings. Time for our second look at the jewels that Spain's Queen Letizia has worn at gala events during her years as a royal. Earlier, we marveled at the glittering pieces she wore from 2004-2009, and in this post, we're looking at the jewels she's donned from 2010 until the present. Enjoy the post, and then let us know in the comments which piece of Letizia's jewelry you'd like to have in your own collection! At the concert held in Stockholm the night before Crown Princess Victoria of Sweden's wedding, Letizia chose two frequently worn pieces: diamond hoop earrings and her Cartier diamond bracelet, which she often wears almost like a cuff. Since the abdication in Spain, we've been talking a lot here about the jewels that the new Queen Letizia will be able to wear at major events now that she's the nation's queen consort. Today, let's have a look back at the jewelry she's worn at gala and white-tie events since becoming a member of the Spanish royal family in 2004. Enjoy this first post, which covers Letizia's first five years of gala jewels, and then head back later today for a second post covering her more recent gala jewels! Letizia's first major gala event as a royal-to-be took place shortly before her own wedding. She attended the wedding celebrations for Crown Prince Frederik and Crown Princess Mary of Denmark in 2004 just a week before she married Prince Felipe in Madrid. At the gala theater performance the night before the wedding, she was one of the only ladies who did not wear a tiara. You don't have to be a royal wife to be eligible to wear a tiara; both Crown Princess Mary and Queen Maxima, for example, wore tiaras before their weddings. But for this event, Letizia wore only a pair of delicate diamond chandelier earrings (here's a better view of them from a different occasion) and a bracelet. We talked briefly earlier about this sparkler from the collection of our Magpie of the Month, Queen Sofia of Spain, but it's such an interesting piece that it's definitely worth a fuller discussion of its history. The diamond loop tiara made by Cartier for a Habsburg queen has also been a bridal tiara for one branch of the Spanish royal family; today, it's back in the hands of the (former) monarch's wife. For a royal family that has faced serious upheaval in the last century, the Borbóns of Spain have managed to hang on to some serious heirloom tiaras. That’s been possible in part because the family has largely maintained personal possession of their jewels rather than consigning them to an official collection of crown jewels. It also means that many tiaras, like the loop tiara, meandered a bit through the family before arriving in the hands of its current owners. 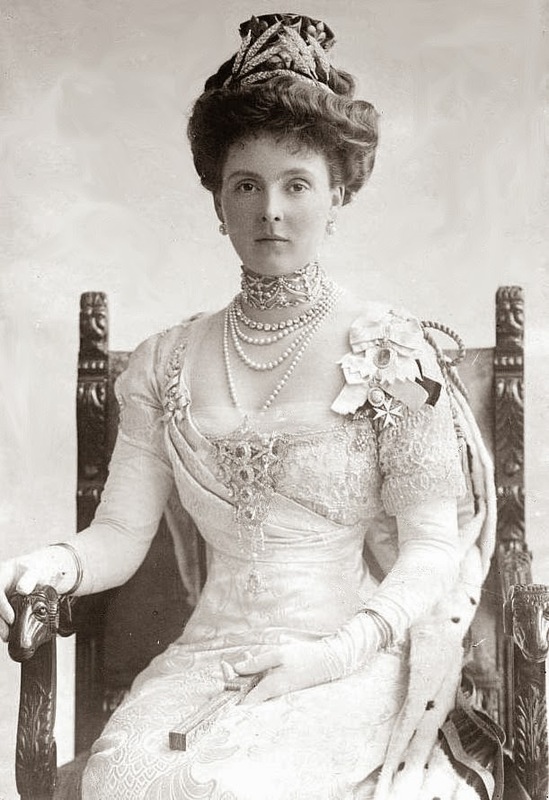 Can you identify the jewels worn here by Queen Louise of Denmark, born Princess Lovisa of Sweden, in 1906? One last post to recap the finery and foolery of the jewels and hats worn to this year's Royal Ascot races. Generally, the royal attendance drops significantly after Ladies' Day, but there are still a few outfits and accessories for us to peruse from the fourth and fifth days. Enjoy! LOVE this bright pink color on HM for Day 4 -- this color is so perfect for a sunny occasion like this, because it makes the wearer all rosy and glowing. And the tourmaline brooch from the people of Saskatchewan is an A+ choice to go with the coat. No need to hide, ladies -- it's your day at the races! Let's survey the jewels (and, of course, the hats) worn by the Windsors at Ladies' Day at Royal Ascot -- enjoy! Lovely in a saturated turquoise color, HM brought out a rather intriguing brooch for Ladies' Day: it's a diamond and aquamarine brooch from the collection of the late Queen Mother. You'll remember during our discussion of the D-Day commemoration that the Queen Mother felt that dressing up when she visited war-ravaged Britain showed that she valued and respected the people she met. This is the very brooch she wore on one of her visits to the bombed sections of the East End during the Blitz. Sophie's excited, and so am I! Let's get right to the jewelry and hats of the second day of the races at Royal Ascot, shall we? New day, new(ish) brooch, same queen. HM clearly loves the new floral brooch that she debuted during the French state visit earlier this month, because she's repeating it again here. I love the brooch -- not such a fan of the multicolored floral embellishment on the hat. This would be so much more elegant if the flowers were the same minty-sage color as the rest of the chapeau. It's that time of year again, magpies -- the most ridiculous, rollicking royal good time of the season, Royal Ascot! The Windsor women always let a little bit loose in the fashion department for the races. Let's have a look at the sparkling jewels (and, of course, the marvelous millinery) that made appearances in the royal box on the first race day. And be sure to head back here in about twelve hours for more from Day 2! In the wake of King Felipe VI of Spain's proclamation on Thursday, there's been quite a bit of talk about the new jewelry that Queen Letizia will have access to in her new royal role. Some have even gone so far as to discuss the "crown jewels" that Letizia would "inherit" from Queen Sofia. Here's the deal, though -- the tiaras, necklaces, and other jewels that the royal ladies in Spain wear aren't crown jewels. None of them are even state property. Every single piece belongs either to the family (in a sort of trust situation) or to the wearers themselves. In the interest of setting the record on Letizia's jewels straight -- and to let us marvel at royal tiaras, because what's more fun than that? -- here's the lowdown on each of the royal tiaras in Spain, including who owns them, who made them, and what happens to them post-abdication. The Cartier Pearl and Diamond Tiara is a piece from the collection of Queen Ena, the British princess who married King Alfonso XIII in 1906. (Ena is the great-grandmother of King Felipe VI.) In the 1920s, she had the jewelers at Cartier dismantle a tiara given to her by her mother-in-law as a wedding present. They reused the gemstones to construct this new tiara, which originally also had emeralds that could be worn in place of the pearls. Ena left the tiara to her daughter, Infanta Maria Cristina; however, after Maria Cristina's death in 1996, it was reacquired by King Juan Carlos for Queen Sofia. She lent the tiara to her daughter, Infanta Cristina, in 2010 for the wedding of Crown Princess Victoria of Sweden. Lots and lots going on this week, from new babies to the beginning of a brand-new reign in Spain. 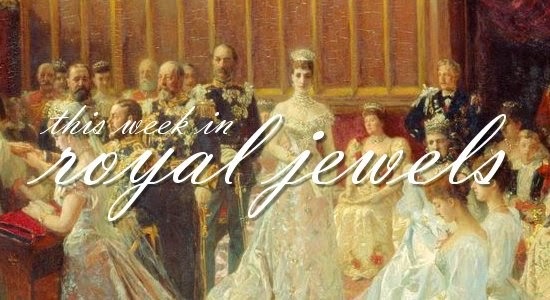 Enjoy some of the best of this week in royal jewels! 10. Even though she's already dressed to the nines in her Garter finery, Queen Elizabeth II always wears a pair of elaborate earrings with her regalia on Garter Day. This year, she selected diamond chandelier earrings from her personal collection. Fifteen years ago today, a rather different British royal wedding was held at St. George's Chapel inside the walls of Windsor Castle. The ceremony joined together the newly-minted Earl of Wessex, youngest son of Queen Elizabeth II, and Sophie Rhys-Jones. No balcony kiss, no enormous guest list, no London cathedral or abbey on the menu for this royal wedding, but the guests still managed to sparkle -- especially the bride! Enjoy this Royal Jewel Rewind, featuring the jewels worn by the Windsors at the last royal wedding of the last millenium! Ahead of the royal wedding, the same questions were asked that are always posed about a royal bridal tiara: will it be something borrowed or something new? Diana had something borrowed (from her family); Fergie had something new, purchased for her (eventually) by her parents-in-law. Sophie's tiara, however, was something sort of in between. It's made of four antique elements meshed into a new tiara. The official word from the palace on the piece is that it was from the private collection of the Queen, but that it had been altered by the crown jeweller. "Wear Rented Gems at Court Function"
A new turn in London's reaction to the royal receptions this season, the first of which occurred a few nights ago, was noted by observers of the unusual and curious. For many years it has been the custom of those who attended the courts at Buckingham Palace for the first time to make a midnight pilgrimage after the palace affair ended to the photographers' shops in the West End, where a permanent record would be made for the benefit of future generations, showing "just how father and mother looked when they were presented to their majesties." After this season's first court the other night, however, it was noticed that a number of jewelers shops in the Bond Street district also were open, and those who sought an explanation of these unseemly shopping hours found the gorgeously bedecked occupants of numerous closed motor cars were returning the tiaras, ropes of pearls, and other jewels they had rented for the evening's wear at court. With inroads into capital made by income tax, increased living costs, and the almost overwhelming burden of maintaining large estates on their accustomed scale of magnificence, it appears that scores of those who for years have been bidden to court functions have lately been obliged to sell their jewels, so that jewelry renters are now become hallmarked as the "best people." In honor of the birth of a new princess in Luxembourg, Princess Amalia of Nassau, today's jewel detective post features two of the nation's grand duchesses. Can you identify the jewels worn here in 1996 by Grand Duchess Josephine-Charlotte and Hereditary Grand Duchess Maria Teresa? Today is Garter Day, the day each year when a special service is held at St. George's Chapel, Windsor for the members of the highest-ranking order of British chivalry, the Order of the Garter. Later today, the Garter knights and ladies will process from Windsor Castle to St. George's in all of their finery, participating in pomp and pageantry that has roots that date back all the way to the fourteenth century. Edward III founded the order in 1348. As with most medieval traditions, there's a grand legend surrounding the order's creation, which, though it's likely not true, is suitably romantic. At a ball in Calais -- back in the days when English kings were still claiming France, natch -- Edward was dancing with the Countess of Salisbury, when one of her garters slipped down her leg and fell on the floor. Supposedly Edward picked it up and put it on his own leg, as one does, and then wagged his fingers at snickering courtiers, declaring "Honi soit qui mal y pense." That phrase -- which roughly means "shame on him who thinks evil of it," with "it" being "putting on your future daughter-in-law's garter," I suppose -- became the motto of the new chivalric order. It's that time again, magpies -- the Queen's very merry unbirthday parade! Let's have a look at the jewelry worn for this year's pomp and circumstance at Trooping the Colour, shall we? The Queen selected a brooch that is often worn for this occasion: the Guards' Badge, which combines the badges of each of the five regiments of the Foot Guards (Irish Guards, Welsh Guards, Scots Guards, Grenadier Guards, and Coldstream Guards) into one large jewel-encrusted brooch, which was probably the same piece previously worn by Queen Mary. Each year, a different regiment troops the colour at Horse Guards Parade; this year, it was the turn of the Grenadier Guards, whose badge is in the top-most position inside the oval of the Queen's brooch. For many years, one of the biggest tiara mysteries surrounding the British royal family had to do with a showstopper tiara associated with one of the family’s matriarchs, Queen Alexandra. But in recent years, much more has been revealed about the piece, which Alexandra received as a wedding gift, and its eventual fate. Most of you will probably be familiar with the tiara under its commonly-used name: the Rundell Tiara. For quite a long time, the tiara was presumably referred to as such because it was believed to have been made by Rundell & Bridge. But while that jewelry house did supply pieces to the British royals, this tiara was made by another familiar name: Garrard. While the tiara was an all-diamond affair, it was a part of a larger diamond and pearl parure made by the company in 1862. The set included the tiara, a necklace, a brooch, and a pair of earrings. 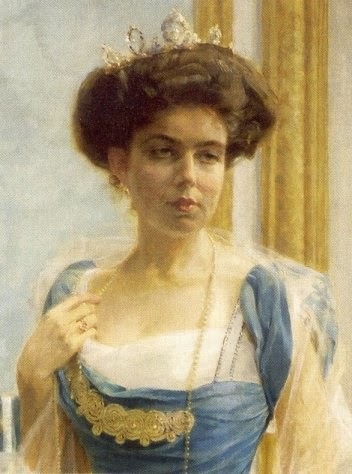 Alexandra wore the necklace, earrings, and brooch on her wedding day (but not the tiara — she wore flowers in her hair instead, which you can see in the portrait above). This week's royal jewel stories include a milestone birthday, a three-brooch week in Britain, and a final hurrah for some royal heirlooms. (And, if you missed them, don't forget to check out our posts on the British state visit to France and the Swedish christening!) Enjoy! 10. Queen Maxima was gorgeous in diamonds and a ball gown at her brother's wedding in Vienna on Saturday. She paired the family's nineteenth-century diamond rivière necklace with an emerald-cut kunzite brooch that belongs to her mother-in-law, Princess Beatrix. 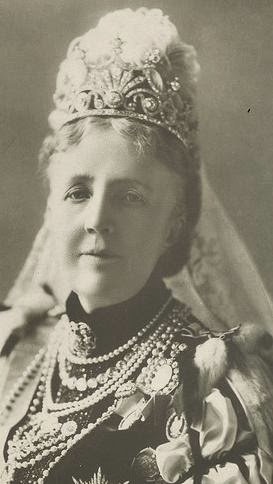 It has a stellar royal provenance (a gift from a British king to a Swedish crown princess), a complicated family history, and a place in a current queen's jewel collection, but the ruby tiara given by Edward VII to his niece, Margaret of Connaught, is rather divisive when it comes to aesthetics. If you had a chance to make changes to this tiara, what would you do? Put on your creative thinking caps and offer us some options! Can you identify the jewels worn here at the 1953 coronation of Elizabeth II by Princess Mary, Princess Royal and Countess of Harewood? Although some of the jewels regularly worn by Queen Sofia of Spain will be passed to her daughter-in-law, Letizia, when the abdication of King Juan Carlos is completed, most of the tiaras worn regularly by Sofia are her own personal property. One of the sparklers that she will retain is her diamond floral tiara. For many years, it was assumed that this tiara was much newer than it appeared to be. Conventional wisdom about the piece said that it had been made in 1962 at the request of the then-ruler of Spain, Francisco Franco, who gave it as a gift to Princess Sophia of Greece and Denmark on her marriage to Prince Juan Carlos of Spain. The jewelry house of Mellerio dits Meller was often put forward as a possible maker of the piece. On Sunday in Stockholm, the newest member of the Swedish royal family was christened in the chapel at Drottningholm Palace. Princess Leonore, the daughter of Princess Madeleine and Christopher O'Neill, was christened on her parents' first wedding anniversary, and many members of the royal family helped to celebrate. Let's have a look at the jewelry that was donned for the occasion, shall we? Leonore Lilian Maria Bernadotte O'Neill, who is a princess styled Her Royal Highness even though her father is a commoner, received a significant piece of jewelry along with her christening: the Royal Order of the Seraphim. Leonore's cousin, Princess Estelle, also received baby-sized insignia for the Seraphim at her christening in 2012. The order dates to 1748. At St. Pancras Internationl in London on Thursday morning, the Queen unveiled a plaque commemorating the 20th anniversary of the opening of the Chunnel. St. Pancras is the London station for the Eurostar, and after she unveiled the plaque, she and the DoE hopped a train to Paris. For this leg of the trip, she sported the first of four brooches for the day! This one features a bunch of grapes set in diamonds gathered by a sapphire bow. She inherited the piece from the Queen Mum. Lots of glitter and pomp this week, with the opening of Parliament in Britain, an awards ceremony in Sweden, and an official visit in the Netherlands. Enjoy! 10. For a concert held on Sunday in honor of Prince Henrik of Denmark's 80th birthday, Crown Princess Mary chose a modern pair of golden earrings. At Cartier’s, the well-known jewellers in Bond Street, London, there is to be seen one of the finest collections of gems ever got together. The exhibits are the tiaras and crowns to be worn by princesses and peeresses at the Coronation, and the proceeds (the charge for admission is a guinea) are to be devoted to the Prince Francis of Teck’s Memorial Fund  for the endowment of Middlesex Hospital. The jewels are housed in a small room, but they are valued at the minimum at £250,000. They make a dazzling collection. Elaborate precautions against theft have been taken. Uniformed officers at the door closely scrutinise each visitor, and among those who walk around the room gazing at the glittering gems are several immaculately-attired men who never seem to tire of the show. They are Scotland Yard men. At night the whole of the jewels are moved to the vaults in the basement and placed in iron safes fitted with quintuple steel walls. As a further protection against burglars the safes are embedded in cement walls. The safes are not fitted with keys, but are opened by means of an intricate combination lock. Of such strength and temper is the steel that a gang of burglars would have to work for nine or ten hours with the most powerful drills and acids before they could penetrate the safe. A small army of men is constantly on guard. Naturally the ornaments to be worn by some of the princesses are among those to first attract attention. The small circular crown of Princess Christian  is unique; it is the only one in the exhibition with a setting of turquoises, which alternate with very fine diamonds on raised points. The headgear of the Duchess of Albany  is made up of a quadruple row of diamonds surmounted in front by a half sun, the rays of which are formed by glittering brilliants. 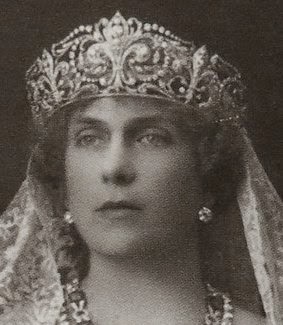 Of unusual design is the tiara of Princess Alexander of Teck (pictured above). It has slanted wheatears formed of diamonds in a curious old setting, and meeting in front. The whole is divisible into corsage ornaments and brooches. It's a big week for the crown jewels of the United Kingdom! Earlier this week, we remembered the role of the sovereign's orb in the coronation 61 years ago. Today, Queen Elizabeth II will process from Buckingham Palace to Westminster to officially open Parliament, one of the great ceremonial occasions in the British royal year. While reading her speech (actually prepared for her by the current government), she will wear one of the most elaborate items from the crown jewels: the Imperial State Crown. Made for Queen Victoria in 1838, and then substantially renovated in 1937 for King George VI, the current version of the Imperial State Crown features a number of important gemstones. Among these are the Black Prince's Ruby (really a spinel), four drop pearls said to have belonged to Queen Elizabeth I, the Stuart sapphire, and the Cullinan II diamond. I could go on and on about this impressive crown, but why do that when I can just hand things over to the lady who will wear it later today? Enjoy! Happy Coronation Day! Sixty-one years ago today, Queen Elizabeth II of the United Kingdom and the Commonwealth realms was crowned at Westminster Abbey. The crowning of a British monarch is one of the only coronation ceremonies that still retains the pomp and pageantry of centuries past, and today, we're looking at a bejeweled object that has been present at every British coronation since the seventeenth century: the Sovereign's Orb. At first, it seems peculiar that the monarch of a modern nation would hold a rather large shiny golden ball as a part of a coronation ceremony. It makes a bit more sense when you think about the ball as symbolizing the globe. Orbs feature a cross surmounting that globe to symbolize the Christian world, divided in three by the jeweled bands to represent the three continents known to medieval Europeans. The Royal Collection website explains that the orb, which is placed in the monarch's right hand during the coronation, is "a representation of the sovereign's power" . The Brits aren't the only ones who have an orb as a part of their regalia. A quick glance through Prince Michael of Greece's book on the crown jewels of Europe finds orbs in the regalia of Bavaria, Sweden, Norway, the Netherlands, Hungary, Bohemia, and Poland, too. Can you identify the jewels worn here by Queen Elizabeth II of the United Kingdom, who was arriving at a a banquet during an Austrian state visit to London in 1966?